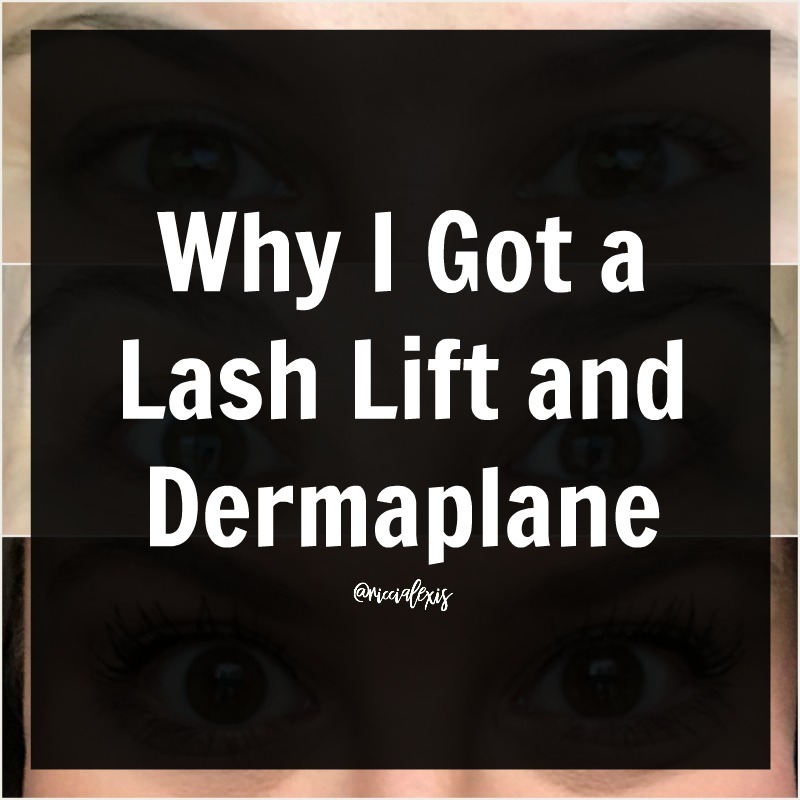 I am finally blogging about my lash lift and dermaplane!! 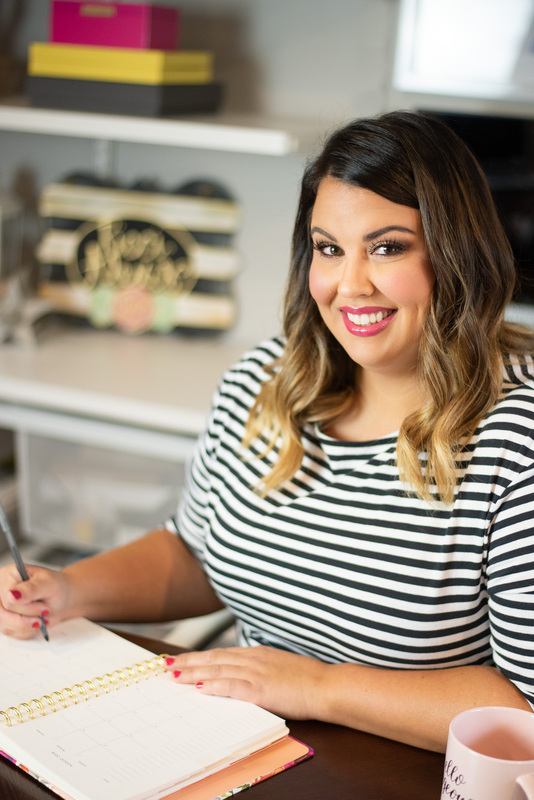 I am so excited to show you my before and afters and I can’t wait to show you all of them!! But first things first, let me tell you all about my search for the perfect salon/spa!! As you may recall I live in central Arkansas and work in Little Rock so I am there pretty much every day. I have been researching salons and spas all over central Arkansas, specifically in Little Rock just because I’m there all the time, but they were all so expensive. For whatever reason, beauty services in Little Rock are almost double (or even triple!!) the price of surrounding areas so I usually look outside the city for beauty services. I have found some amazing salons and spas in surrounding areas and have always been pleased with them!! So after much research I finally decided on Whiplash Beauty in Hot Springs for my lash lift and dermaplane. I had heard of Whiplash Beauty because one of my sorority sisters used them for her wedding day makeup and their Facebook page has fantastic reviews. Plus their price point was amazing and they were also on the first page of all my Google searches and y’all know I Google everything!!! HA!! So what exactly is a lash lift and dermaplane?? Good question!! I have had several people ask me what I got done because they had never heard of either service, even my own sister. HA! Let’s talk about the lash lift first. If you are anything like me you hate your lashes. I think that no matter how long and full your lashes are you still want more, being a woman is both a blessing and a curse. We always want what we don’t have. Am I right?? I had looked into getting lash extensions but with my crazy work schedule I didn’t think I could keep up with the maintenance and let’s be real, they are expensive!! I also love to use facial oils and you can’t use those when you have lash extensions and I am constantly rubbing my eyes (especially during allergy season!!). So for many reasons, extensions just wouldn’t be right for me. Enter into the picture, a lash lift!! A lash lift is basically a perm for your lashes. 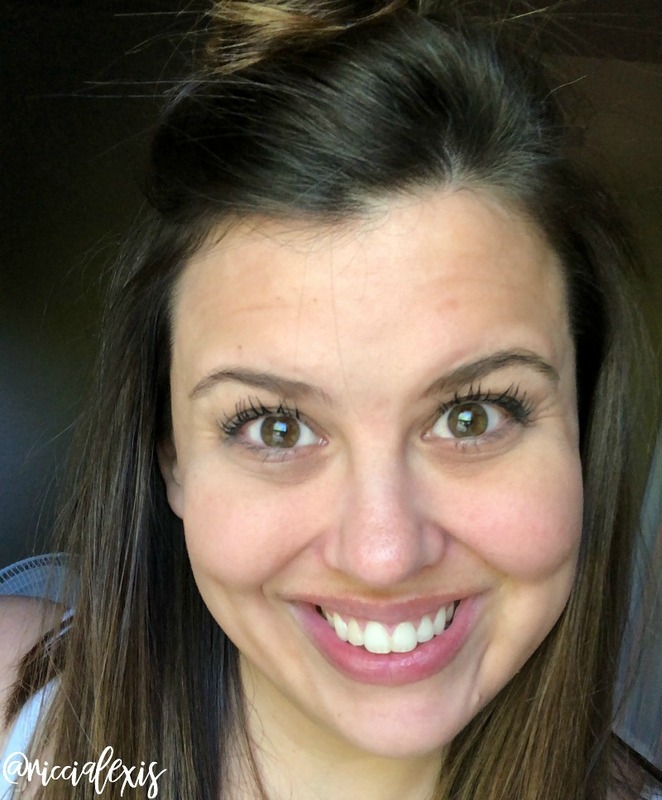 During the procedure you lay down and get comfy, a sticker thing (sorry for the non-technical term…lol) is placed on your lower lashes to keep them out of the way, and your lashes are stuck to a tiny foam roll that will keep them curled upward. A solution in placed on your lashes and you sleep for 30 minutes while it processes (I had been awake for almost 24 hours when I went in for my lash lift so I slept HARD while my lashes were processing, HA) and then wake up with beautiful lashes!! Here are some before/after photos I took really quickly with my iPhone. 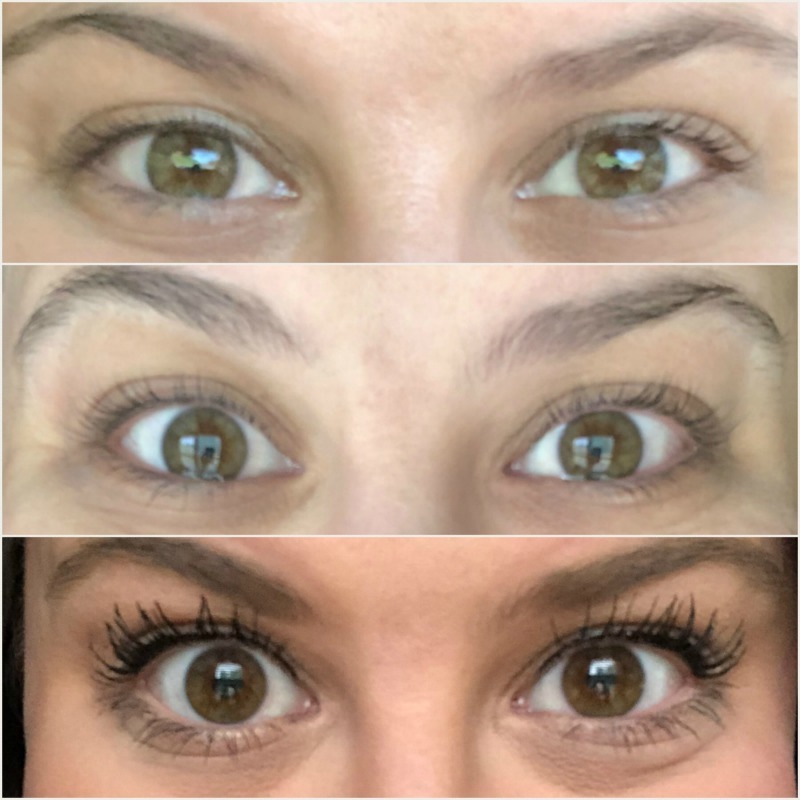 The top photo is right before I walked in, the middle is right after I walked out and the bottom is the day after with mascara on! For reference here is a post I did with my everyday makeup routine and here is the specific mascara I used in this pic (two coats and that’s it!!). A lash lift will last as long as your natural lash cycle, so about 6-8 weeks. Your lashes naturally fall out and regrow on their own and so when these fall out they will grow in as they did before, stick straight in my case. HA! 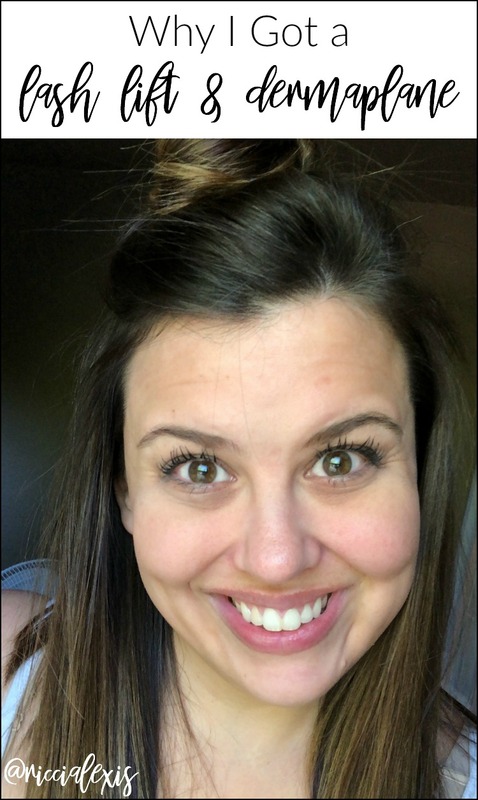 I think the lash lift was worth every penny and I would definitely do it again! You can also get a lash tint if your lashes are super blonde!! Now onto the dermaplane!! Dermaplaning is an exfoliation treatment where a trained technician uses a scalpel to scrape off the outer layers of skin on your face. I know that sounds graphic and painful but trust me when I tell you that it didn’t hurt one bit and y’all my face was as smooth as a baby’s bottom for days afterward!! Dermaplaning gets rid of all the dead skin and peach fuzz on your face and even helps diminish the appearance of acne and fine lines. I had three pimples on my face and after the treatment you couldn’t even see where they had been. I am also getting self-conscious about my crow’s feet because my Botox is wearing off (six months after I got it…lol) and I swear it made those lines not look as deep!! Here are some before/afters I took with my iPhone. The first is in the salon right before I had it done, the second is in my car right after and the last one is a week after with absolutely no makeup on my face!! My face has seriously never been more clear!! I have to admit that I was nervous about the after, especially the drive home because I could just imagine my face being all red because of the scalpel but y’all. You couldn’t even tell, except the fact that my face was super smooth, HA!! You can get your face dermaplaned as often as once a month and I fully plan on keeping it up when I get my lash lift done, so I will get it done probably every two months or so. I love how clear this made my skin feel. During these hot spring/summer months I like to get away with wearing as little makeup as possible and I think this will help a lot!! In this pic I am only wearing mascara (and moisturizer of course)!! So WHY did I get a lash lift and dermaplane? Because they make me feel better about myself!! I love my lashes and my skin and I think that’s reason enough to keep getting them done. If you have been on the fence about either of these treatments/services then I highly suggest you do it!! And if you are in central Arkansas and are looking for a place then you should definitely check out Whiplash Beauty. Also – I was in no way compensated for this post by Whiplash Beauty. I paid for these services on my own and all thoughts are my honest opinion. Know people will ask so there you go. HA! Have you ever gotten a lash lift?? Your lashes look amazing. I get last tints/extensions and I love the process. 30 minutes for 12 weeks of awesome lashes…yes please. I’ve never heard of a lash lift before. I don’t like my own lashes because they’re pretty thin and short so the idea of nicer looking ones sounds good to me. The dermoplane sounds interesting. Especially if it helps get rid of dead skin and refresh the face. The flashlight looks great on you and would speed the routine up in the morning. Ohhh I like the sound of a lash lift and you look amazing after the dermaplane as well you can really see the difference in the glow of your skin! I recently had false eyelashes for a party and it wasa lot of fun but also took some time. I do like the idea of natural eyelashes that look just as good and the dermaplane looks great too. Wow, I did not even know this was an option, the results are amazing! I like that this is a pretty simple thing to do with instant results. I had never heard of a lash lift before! I think people should do whatever they want if it makes them feel better about themselves. Oh wow what a difference! Your lashes look amazing! I need to do this! This is my first time hearing of this. I had not idea this service was offered. Love your results! I am super curious about whether these are available in my area. I use a Rodan + Fields product for my lashes that has greatly improved the thickness, now I need to the lift to see them. Thanks for the info! Had no idea about Lash lifting and Dermaplaning. Learnt something new. But both the processes sound quite hassle-free and simple. Worth the effort gauging by the results that you achieved. Indeed you can see a lot of difference. You look radiant and glowing in the after a week picture. Totally worth it and your decision to take it is really perfect. The results was awesome! It made a big difference and your lashes are beautiful! There’s so much beauty products these days that I don’t know about lol. I’ve seen a lot of product out there for voluminous lashes. I am so tempted to try it but so expensive. This one you have looks good and very promising. Your lashes look awesome. I have never had mine done before. I do love me a good mascara though.